This tournament is open to ANY BOWLER who is at least 17 years of age as of the first day of this tournament. 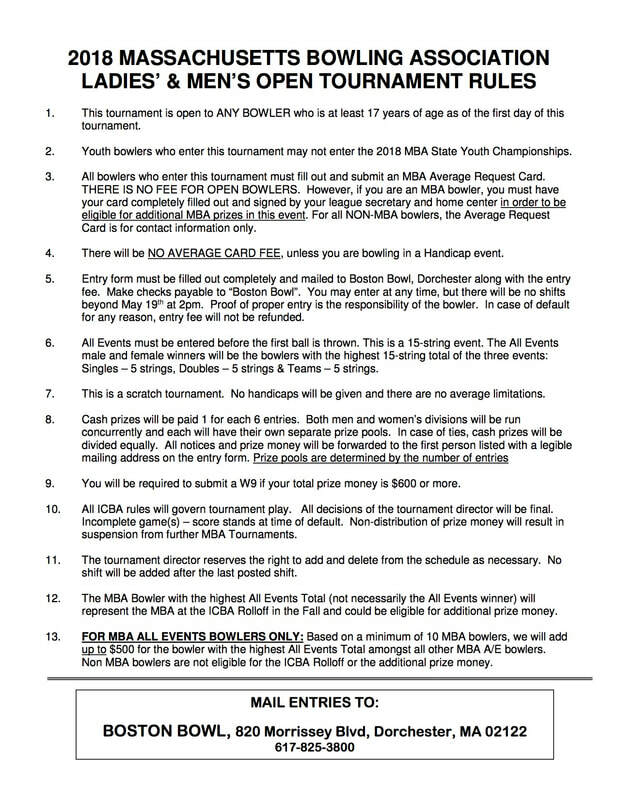 Youth bowlers who enter this tournament may not enter the 2018 MBA State Youth Championships. 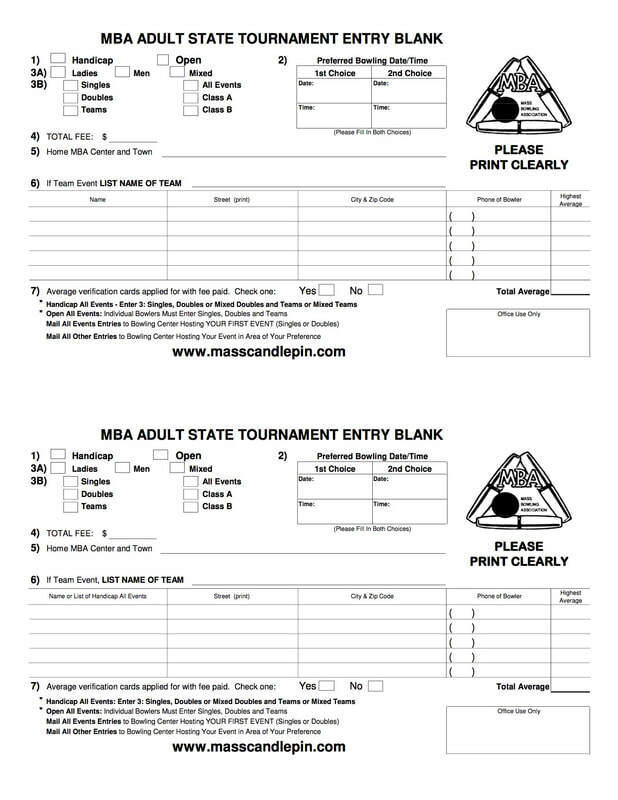 All bowlers who enter this tournament must fill out and submit an MBA Average Request Card. THERE IS NO FEE FOR OPEN BOWLERS. However, if you are an MBA bowler, you must have your card completely filled out and signed by your league secretary and home center in order to be eligible for additional MBA prizes in this event. For all NON-MBA bowlers, the Average Request Card is for contact information only. There will be NO AVERAGE CARD FEE, unless you are bowling in a Handicap event. 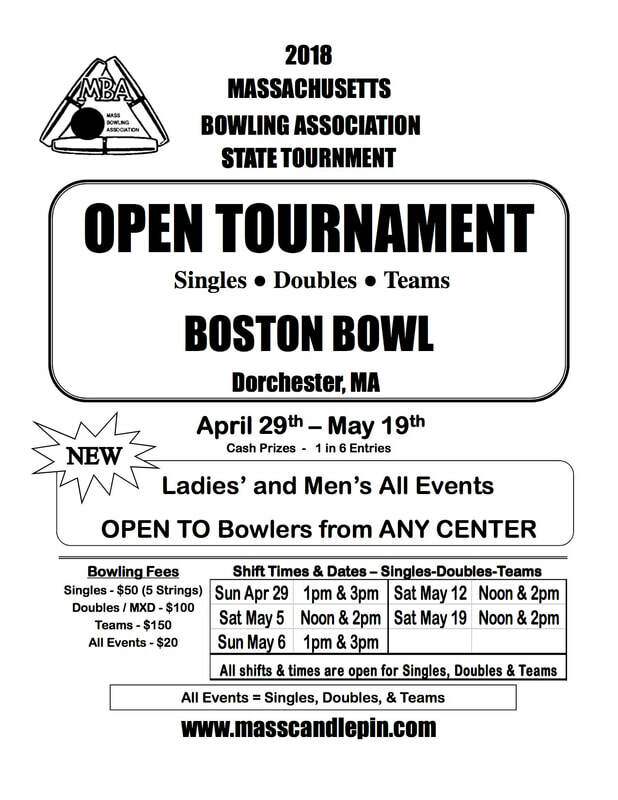 Entry form must be filled out completely and mailed to Boston Bowl, Dorchester along with the entry fee. Make checks payable to “Boston Bowl”. You may enter at any time, but there will be no shifts beyond May 19th at 2pm. Proof of proper entry is the responsibility of the bowler. In case of default for any reason, entry fee will not be refunded. All Events must be entered before the first ball is thrown. This is a 15-string event. The All Events male and female winners will be the bowlers with the highest 15-string total of the three events: Singles – 5 strings, Doubles – 5 strings & Teams – 5 strings. This is a scratch tournament. No handicaps will be given and there are no average limitations. You will be required to submit a W9 if your total prize money is $600 or more. All ICBA rules will govern tournament play. All decisions of the tournament director will be final. Incomplete game(s) – score stands at time of default. Non-distribution of prize money will result in suspension from further MBA Tournaments. The tournament director reserves the right to add and delete from the schedule as necessary. No shift will be added after the last posted shift. The MBA Bowler with the highest All Events Total (not necessarily the All Events winner) will represent the MBA at the ICBA Rolloff in the Fall and could be eligible for additional prize money. FOR MBA ALL EVENTS BOWLERS ONLY: Based on a minimum of 10 MBA bowlers, we will add up to $500 for the bowler with the highest All Events Total amongst all other MBA A/E bowlers. Non MBA bowlers are not eligible for the ICBA Rolloff or the additional prize money.